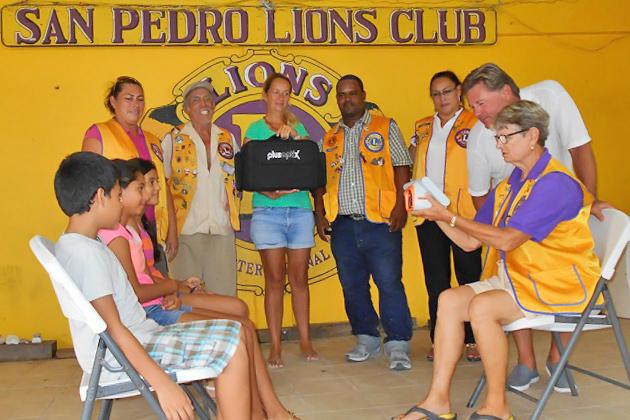 The San Pedro Lions Club accepted the national challenge of Lions Zone 59 to participate in an eye screening program to test the school children’s eyes in Belize. Lion Jan Brown reports that the San Pedro Club is responsible for schools on Ambergris Caye, Caye Caulker and the Corozal District. Until recently, the four Lions Clubs of Belize have been sharing two machines to perform their work nationwide. The OptixPlus machines were obtained through a grant from Lions International and gracious donations of local businesses in Belize. When Mr. Don Listwin, Founder of BelizeKids.org, heard about the program, the organization stepped up to the plate to donate not one, but two of the machines to the San Pedro club. With two machines in their possession and not having to wait their turn to have the machines in order to visit the schools, Lion Jan and her committee will continue what was started in November 2015. By the end of the 2015/16 school year, they had tested 2,313 children in San Pedro and Caye Caulker, with 280 referrals for glasses. Two children were referred to BCVI clinic in Belize City for eye malady’s which was found by the testing and follow up by a visiting Optometrist. The 2016/17 school year of testing will begin in the Corozal District with an approximate enrollment of 12,000+ kids. “We’ve a big job ahead of us, but it all starts with the first school and a dedicated committee,” says Lion Brown. “We look forward to our work with the new machines donated by BelizeKids.org. Thank you is not enough, but thank you to Don, Gil Nunez, Jeff, Rebecca Coutant and to Lion Mel Paz who introduced BelizeKids.org to San Pedro Lions.” (photo caption: Don Listwin, Founder of BelizeKids.org, watching Lion Jan Brown, SP Chair ESP, testing students' eye). Click for more information about BelizeKids.org.